I just don't have much else to say, other than there are MANY other shows to watch that are better and will AT LEAST provide more to talk about by the time they're over. Like my title says, "Funny, but forgettable." For those who enjoy the slice of life with not real plot, just lots of fun and humor this one is for you. It looks like a harem but it's more of just a group of girls comedy with a guy thrown in for added gags once and a while. I would recommend this show to anybody looking for a good laugh. GJ Club is a nice, laid back anime with no real romance, plot, or anything of the sort. Just random situations and comedy to make the viewer laugh and stay amused. Although some people might not like that, I do, and I think it's enjoyable to watch. This Is a wonderful anime that resonates well with my heart in various scenes. I love the characters and the laid back setting. It's very near a perfect slice of life series. I only have one problem with it. It ends without finishing. The romantic tension is obvious from the very beginning and it goes no where. Such a waste. 4/5 for fumbling the ending so hard. While watching this, there was a sense of connectivity to be had, despite overall being pretty loose. Two times this came up was firstly, when any information from previous episodes came up again, and second, in the cast itself. The first should be pretty obvious after going through the series; most of the episodes contain what you expect from a high school club-without-a-goal slice-of-life, except the cast will bring up random tidbits here and there that comes from a previous episode. It's a simple concept, yet it's filling when it happens. The second, the cast is relatively stock (you have the tsun, the cool beauty, the clueless, and the angelic), but because there's a lack of plot so to say, there was a lot of time for each character to develop, all of which have quite a significant change in at least one aspect by the end of the series. There's also the outcast character who honestly only seems like an outcast later on when how new she is is pointed out. Overall, the characters more or less don't fit together, like you could imagine the club members would never be together if not for the club, and then you remember, "That's kinda the point". How they don't fit together makes them fit together, if that makes any sense. Well, I've talked my portion. My final words are that it's a nice series that focuses less on the actual events and more on the characters. Good job GJ Club! So, as you can tell by the title, this series doesn’t really have (or need) an ongoing plotline. I guess that is the same for most slice of life shows, but still true. However, the characters in this show are so endearing that the lack/absence of a plot, in a weird way, helps it. It gives the characters the entire episodes to just interact with each other and the result is, in my opinion, 12 extremely entertaining episodes. The voice actors who brought the characters to life did a splendid job of playing of each other, and it seems like they had fun recording the show. Admittedly I am a fan of slice of life shows in general, but this one stands out and definitely gets my recommendation. A great anime to lift your spirits!! I'm grateful I queued this and took the time to watch an anime that I won't forget. The GJ club is full of funny moments and will never leave disappointed (until you finish it the you'll be disappointed there isn't more to watch!!). I think if you're just coming off of an extremely long and very emotionally invested anime I would suggest this as a "take a break" anime because of how light and friendly it is! Although the ending may make you a little teary eyed, or maybe that was just me? I get emotionally tied to characters very easily so most anime (especially SoL) will do that to me. But in the end it just goes to show you that you don't need to have some straight forward plot being shoved in your face instead it should be watched with the intention of sitting back and enjoying the ride rather than being concerned about plot when clearly life is taken day by day. I hope everyone got to enjoy this anime as much as I did and I hope to discover more anime like this in the future!!! A slice of life gem in the newfangled “Unharem” department. There has been some confusion as to what genre this anime is from. This is purely a slice of life comedy, although this can be confused as being part of the harem genre. As some reviewers point out, despite the main cast consisting of one male and more than one or two females, the girls strictly consider the male character as a friend almost all the time. Any form of character developments between the genders often end with putting the main male character on the spot in certain situations. This anime could probably be the pioneer of a new genre called the “Unharem” genre. With this in mind, let’s see what this possible newfangled genre is like! Characters: The main male character of the series is Kyouya Shinomiya, an ordinary guy who nevertheless has redeeming qualities that makes him a good fit with the other characters in the club: Mao Amatsuka, the petite president of the club who is a senior that doesn’t want to grow up, Megumi Amatsuka, Mao’s younger, taller, loving-kindness filled sister who is good at making things but is very particular about her weight, Shion Sumeragi, a datapoint savvy chess maven who isn’t too keen on everyday life, and Kirara Bernstein, a mellow yet superhuman “all brawn, few brains” catgirl. Later on, Tamaki Kannazuki, the expressive and occasionally snarky freshman who likes to eat snack foods without gaining weight, joins the club, while the other side characters appear occasionally throughout the series. Despite the possible stereotypes at first glance, the characters have enough personality about them that makes them very charming to watch. It feels like they are a part of a fine coalesce group and they complement each other very well. Plot: You’re basically seeing the characters going through their activities in the GJ Club room. Content: And what’s within the GJ club room? It often consists of random moments, antics and everyday occurrences, projects that range from important to whimsical, discussing about situations and things while the actions and humor are taking place as well as occasionally awkward situations with the cast (don’t worry. This is the type that other anime can pull of much worse than this!). In terms of the format, this series gets it right when it comes to an episodic look-see into the daily life, activities, tidbits and minor shenanigans of the GJ Club, much like fitting Azumanga Daioh and/or SKET Dance in a single room. However, in the first episode we start out in what feels as though we started in the middle of the anime, and not the beginning. Some would say that that’s part of the nature of a good episodic anime (e.g. Start anywhere without feeling like you missed anything.). However, considering we don’t know a couple key things in the anime (e.g. what happened before the main character joined the club), we seem to join in without any knowledge of what happened before that, let alone the GJ Club itself. Speaking of which, almost all the activities and situations in the anime (at least where the camera shows) take place only in the GJ Club room, which is a nice touch for an anime that focuses on just the club. Art: The art gives off bright, warm colors within the soft and cute, yet realistic looking characters along the nicely detailed backgrounds. It’s much like the art style of Lucky Star, but with bolder outlines as the colors stand out, showcasing their charm like the characters themselves. The art also contains interesting little details, like the fact that the characters’ pupils look like candles (Not sure if that was on purpose, but it’s a nice way of seeing life inside the characters along with the bright, warm colors!) Also, some reviewers pointed out that the characters occasionally turn into a Chibi version of themselves, which exemplifies the cute and silly nature of the anime. The Chibi versions do a great job at making themselves even cuter without looking rushed or disproportionate from their original form, as though it’s seamlessly the same person throughout the time. Music: The music feels like an interesting mix of Azumanga Daioh and Lucky Star, sounding like electronic woodwinds, strings and percussions playing along with the electronic shapes and embellishments that dot along the tracks. All of this fits the situation in the anime that’s either fun and silly or subtle and down-to-earth, along with an outstanding bumper track inside the episodes. There is even a cleaver use of chiptune music along with a genuine chiptune music track to round it all out! Overall: If you’re not a fan of the harem genre (e.g. this review writer! ), don’t be afraid to give this anime a shot! There are plenty of comedy and slice of life situations that makes up for what’s on the cover and rounds out the characters very nicely throughout the series. Those who are fans of the harem genre will find this a nice change of pace from the usual fare. Either way, this is an enjoyable series that will leave you on a happy and satisfied mood after the series is over. - Bright and warm colors with cute, yet lifelike animation. - Episodic structure done right! 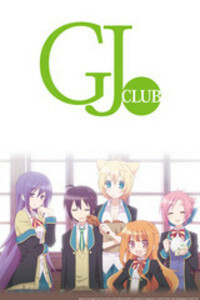 - Clever club-centric theme of the anime. - Genuinely funny moments abound! - Very fun and down-to-earth music. - A couple too many awkward moments (although there are other series that can pull off MUCH worse than this!). - Felt like we joined in the middle of the series, and not in the beginning. i had only heard about this show through word of mouth and decided to give it a try, it was cute and pretty much the same kind of slide of life show with only one season, i did enjoy the story line and the characters each had something to like about them. The end of the show seemed very genuine, like you had a feel of how the voice actors felt about the show ending. So sad it had to end so soon. Definitely one of my favorite anime. Each character was unique in there own way and fashion. Did a good job of demonstrating that people outside of Japan do speak English and it even had the Japanese voice actors attempt English as well. Definitely can;t wait for the second season to be released.